Giant swarm of bees descends on grandmother's car to free queen trapped inside. 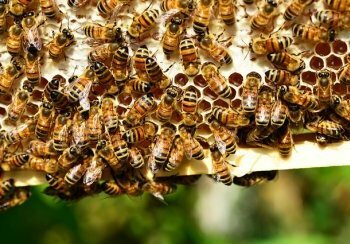 An elderly lady from Wales was amazed to realize a huge swarm of bees had descended onto the boot of her car while she was visiting a natural reserve with her son. The swarm was apparently following a queen, they believed was trapped inside the car, for more than a day by clutching to the outside of the vehicle. “This behavior is typical for the season and the bees can be extremely aggressive when swarming, since it is a strong instinct for the them to follow and protect their queen.” explains local bee-keeper and self-proclaimed pollination enthusiast Bert Dorsata. Luckily, this time, the bees stayed on the outside of the car and the elderly lady escaped the day long ordeal relatively unharmed and a great story richer. She later said the swarm eventually dispersed on its own once she dropped off her son, a middle-aged man dressed in a bright yellow two-piece suit, who was seen running from the car. “It was all just a silly mistake.” states a bemused Mrs. Izzard. THERE IS SUM SUBLIME MATERIAL ON THE INTERNET, BUT THIS IS SO AMUSING. Everything you said made me want to stab myself with a long dead rodent. This isn't just garbage, it's offensive garbage. I want this printed on a hat. Edited: sorry, wrong post!